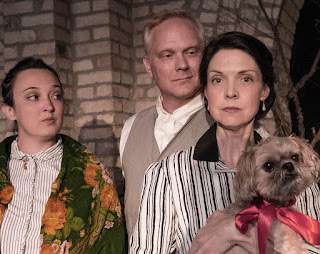 Fortune’s Fool Theatre has a peculiar but charming little chamber musical going on over at Open Eye Figure Theatre right now, an adaptation of Anton Chekhov’s short story The Lady With A Lap Dog. It’s charming because the music by Robert Elhai bounces right along with the often cheeky lyrics from book writer Daniel Pinkerton. It’s peculiar because, if you know anything about the source material, it’s basically a romantic comedy/drama about a long-running extramarital affair. So, depending on how you feel about extramarital affairs, you may play right along, or find yourself fighting not to find it charming, and occasionally failing and enjoying it anyway. The latter would be the category into which I fell. The Lady With A Lap Dog examines love from an unusual angle. Back in late 19th century Russia, Dimitri (Joel Liestman) is a married businessman who vacations by himself in Yalta while his wife Dasha (Laurel Armstrong) tends to their home and children back in Moscow. Dimitri regularly cheats on his wife with the wives of other men, often right under their noses. However, it’s gotten so unchallenging that he doesn’t find it all that fun any more. And then he meets Anna (Andrea Leap). Anna is also vacationing by herself, well, in the company of her faithful dog (a puppet). Anna’s husband is a very busy man running the business back in Smolensk, no time for vacation - also, his health isn’t that great. Dimitri charms Anna’s dog, then Anna herself, and they begin an affair. Then the unexpected happens - they actually develop feelings for one another. They each fear those feelings are one-sided, and are relieved to discover it’s mutual. But they’re both still married to other people. They live in cities hundreds of miles away from each other (and this is before the advent of air travel, or even the regular use of cars. Phones were just barely getting started.) What hope does their relationship have? Pinkerton and Elhai have taken pains to further flesh out the character of Anna, to make the story more balanced, as the source material was largely from the male perspective. They’ve done an equally good job bringing to life the character of Dasha, Dimitri’s stoic, long-suffering wife. In fact they have done their job with these two key female players so well - and the two actresses do such a great job in their roles - that I ended up thinking both women deserved better. (This is no reflection on Liestman as a leading man, he’s great, too.) But I have to keep reminding myself, this is pre-20th century. Women may deserve better but back then they rarely got it. You found stability and happiness where you could - and if you could get both in the same place, you were very lucky indeed. The Lady With A Lap Dog is about people making the most of what they can get. Which, honestly, isn’t the worst thing a play could say to an audience. The world is imperfect. Life doesn’t always serve up a happy ending. Happy-ish is a decent end point for most of us. If we could all sing like Liestman and Leap and Armstrong, things might seem brighter and more beautiful still. 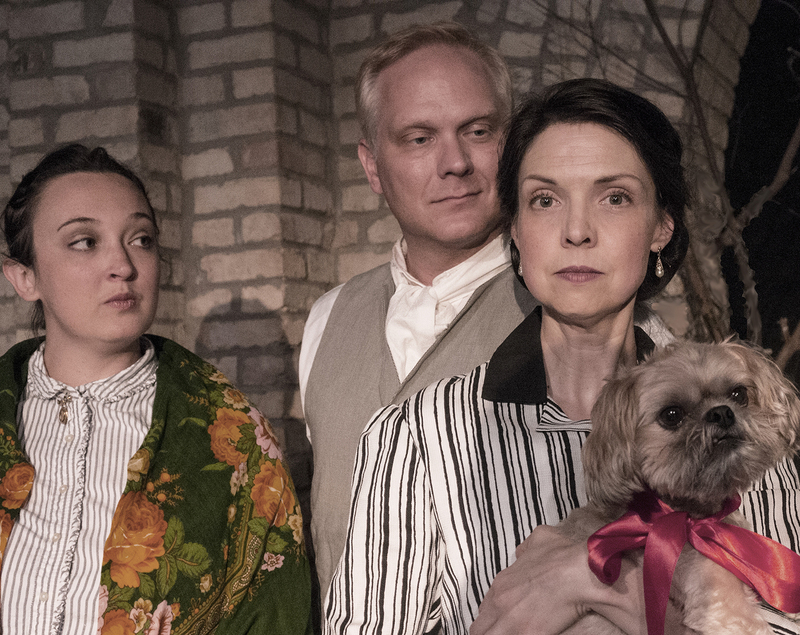 Director Nicole Wilder and her performers, plus the three-lady band of music director Jill Dawe on piano, Dee Langley on accordion, and Diane Tremaine on the cello, create a world full of music and wit that more than does justice in bringing Chekhov’s story to the stage.